Around 60 tap students recently took part in a nationwide event to try and break a world tap dancing record. The Tapathon event was in aid of Children in Need and raised funds through T-shirt sales and sponsorship. 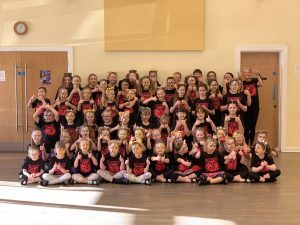 Tapathon is held in hundreds of different locations throughout the UK and involves dancers of all ages and fitness levels in attempt to break a world record as well as raising funds for the BBC charity. The current world record is 7,596 dancers all doing the same routine to the same music. The Aylsham part was hosted by Broadland School of Dance and took place at the ACT Centre last Sunday afternoon. 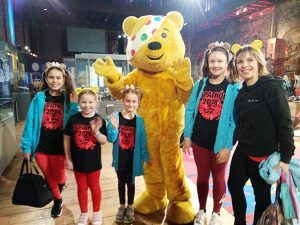 Before the record attempt, the students were also invited to the regions recording of Children in Need live from Norwich Castle. Some of the students and dance teacher Michelle appeared on the TV. Whilst hopeful that this year’s attempt is good enough to beat the current world record, the dancers will have to wait a week or two for the exact number of participants to be verified. Michelle with dancers at the BBC broadcast. This entry was posted in Aylsham, Home Page and tagged Aylsham, Broadland on November 20, 2018 by Just Regional.